We have all seen the advertisements from lending institutions that promise a distinctive approach to getting homebuyers into the home of their dreams. 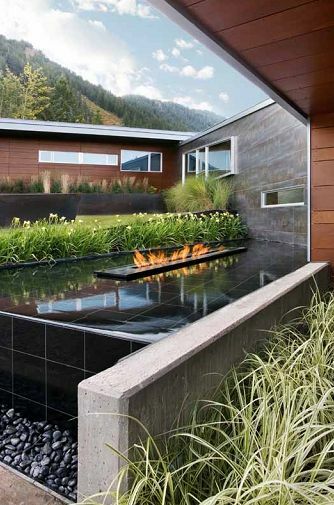 The truth generally is that, although the ads paint a pretty picture, most experiences end up being huge disappointments, especially to those that are trying to purchase property in a resort market like Aspen or Vail. While other institutions make these claims, Blue Sky Mortgage has a remarkable 38-year history of getting purchasers to the closing table through their exclusive, long-standing lending relationships. To understand what makes Blue Sky Mortgage so unique, one must start with its history. Its president, Jimmy Brenner, has strong roots in Aspen and Vail. His family became Vail locals in 1972, after many annual ski trips between the two resort towns. Brenner’s father, a former Savings and Loan executive from Milwaukee, recognized a niche in the two towns that allowed him to get back into the mortgage business. During his time as an S&L executive, his father also occupied the role of secretary for the 200-member Midwest Savings Conference an organization of small community banks around the Midwest. Those relationships would later prove to be crucial to the success of the First Western Mortgage Company, which Jimmy took over from his father and later sold. Brenner’s father started the business the old-fashioned way, loading up a big, leather-bound suitcase full of loans and traveling to cities such as Milwaukee, Chicago, Detroit, and Minneapolis. He would not return home until every loan sold. Today, those relationships with small community banks are helping to support the real estate markets of Aspen, Vail, and other mountain resort communities. While most of today’s well-known lenders adopt computer-generated decision-making systems, Jimmy continues to do business much like his father did – through direct, working relationships. Blue Sky Mortgage specializes in getting homebuyers to the closing table. While they are experts in all traditional types of loans, they specialize in working with unique circumstances such as non-conforming jumbo loans. These can include condominium hotels, foreign national borrowers, entity titles, and exchanges. Due to its true portfolio lending relationships, Blue Sky Mortgage can overcome more circumstances than other lenders, who may be limited to Fannie Mae, Freddie Mac, FHA, or VA programs. 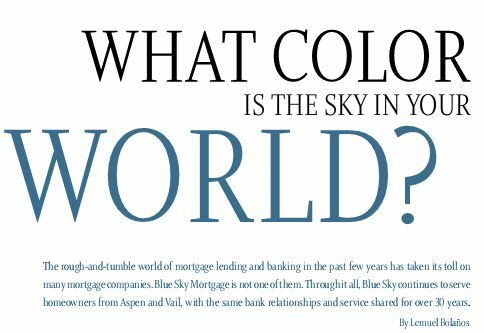 Blue Sky Mortgage continues to be the valley’s creative mortgage resource that even local community banks look to as they navigate the current market. Homeowners who are working with non-conforming loans are sure to see far more blue skies in their world when they work with Blue Sky Mortgage. Previous post Practice, Practice, Practice.